You can help free human rights defenders in Turkey. Imagine being arrested simply for defending human rights. This is what happened in Turkey to Idil Eser, the Director of Amnesty Turkey, Taner Kilic, Amnesty Turkey’s board chair, and nine other peaceful human rights defenders in July. Taner has already spent more than 100 days in detention with no end in sight. While Idil and the other nine activists have been released on bail, they, along with Taner, still face up to 15 years in prison on charges of “membership of a terrorist organization.” This investigation is ridiculous. 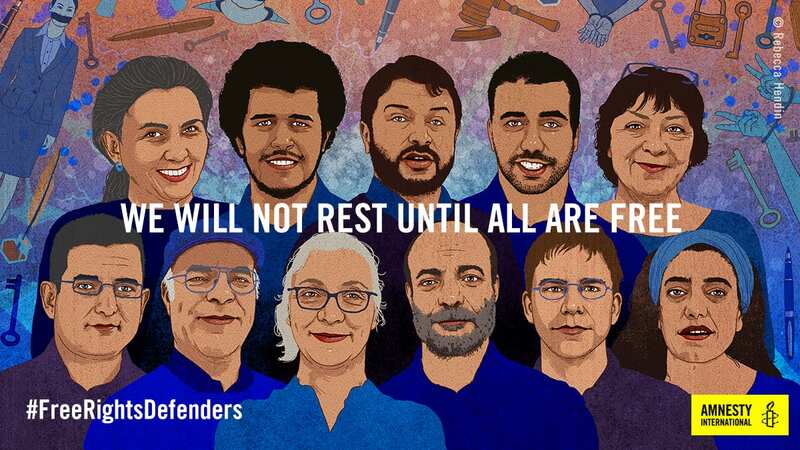 Taner, Idil, and the others are peaceful human rights defenders, not terrorists. Use the tools below to add your voice to our global demand that Turkey release these brave human rights defenders and drop all charges against them! Sign the petition to tell Turkey to stop persecuting human rights defenders and drop all charges against them. We need your help to demonstrate global outrage: Tweet and post pictures to Facebook and Instagram using #FreeRightsDefenders and tag us @amnestyusa.